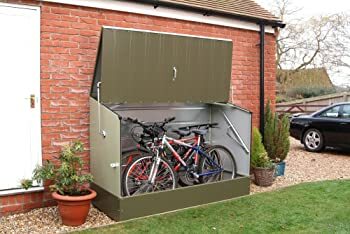 Bike storage shed is a great way to preserve the condition of your bike, as well as deter criminals. Depending on your specific needs, one storage shed may be more suited to you than another. But how do you know which one? In this article, I’ve put together a list of the ten storage spaces. Each unit has their own specific set of strengths, which I’ve outlined for you. I hope this helps you choose a unit that best fits your needs. Build Your Own Bike Storage Shed? 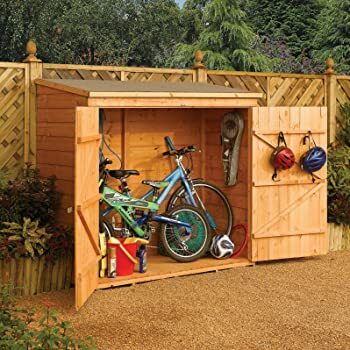 There’s so much that goes into selecting storage shed that’s perfect for you and your bike. You’ll need to consider variables such as materials, location, windows, and so much more. Any of these factors affect your bike’s safety from the elements and would-be criminals. First, you’ll need to choose the best place for your bike’s storage unit. There are two main things to bear in mind when selecting a space. One, you’ll need to choose an area that thieves will have the most difficulty accessing. For example, a fenced yard with a lockable gate is a better choice than your un-fenced side yard. The second factor is the shed door’s visibility from your home. You want to be able to glance out a window and ensure that the door is still closed, for one. Also, it makes it easier to spot any suspicious activity. A criminal will have to break into the unit in plain sight of your house if they want what’s inside. This, in and of itself, can be a powerful crime deterrent. Lower grade wood is pretty cheap and it blends in well with other structures. The less conspicuous your shed, the less likely criminals will be to target it. Also, wood offers a certain measure of aesthetic to your property. Metal can be glaring and industrial, while plastic can appear tacky. Wood adds an individual touch of rustic beauty to your property with little effort. The biggest downfall of wood is its potential to rot or decay. It takes a little extra maintenance to protect wood from rot, termites, and other damage. If you neglect the upkeep of your shed, then the rot could affect security. There are many benefits to a metal shed. It’s fire retardant, for one, and it can be the most durable choice in some cases. The more expensive models have thick walls, posing a significant challenge to criminals. Although wood rot or termite infestations won’t be an issue, a metal unit is under the threat of rust. Keeping the unit painted and treated can circumvent the problem. Another issue is that not all metal units are created equal. If you choose a cheaper, lower quality metal unit, you may sacrifice its integrity. 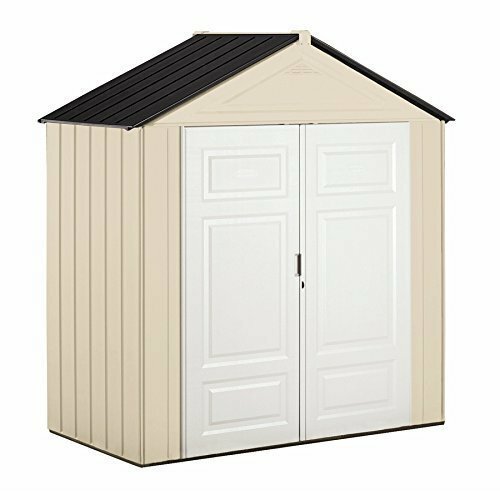 Thin metal walls compromise your shed’s security, so choose wisely. The best thing about a plastic storage building is that its low maintenance. You don’t need to paint them or worry about rust, rot, or termite infestation. 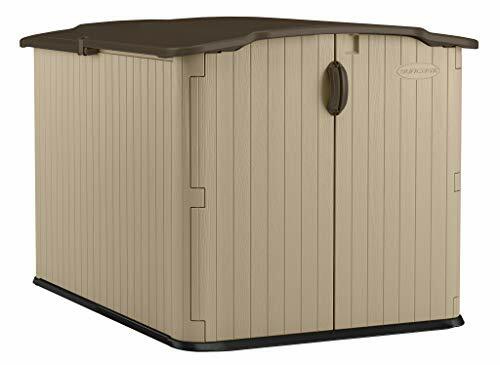 Best of all, they even run cheaper than wood or metal storage sheds! Plastic accessory buildings offer less security than metal or wood; You’ll need to take extra precautions to ensure that your bike is safe. Plastic units also tend to collect more condensation than wood or metal units. Lack of proper ventilation could cause rust on your bike, possibly ruining the chain. After purchasing a storage space for your bike, take time to examine it for any possible weak points. You’ll need to pay particular attention to the hinges, the lock, and windows. 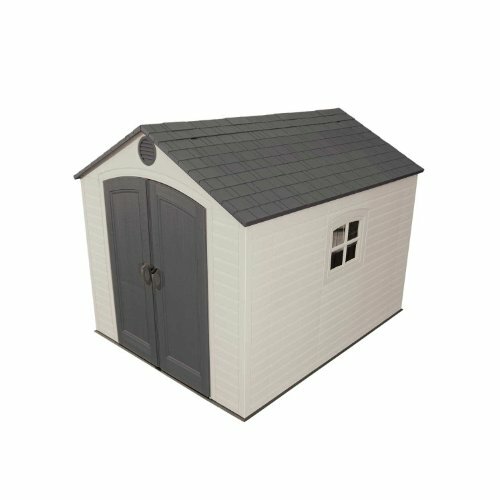 This resin shed from Suncast is durable and low maintenance. Its compact design makes it ideal for those low on space. Despite its size, it accommodates at least two adult bikes. The lid of the unit slides back so that it’s easier to arrange your bike. There is a place to use two 1 1/2″ padlocks to secure the unit, where the roof meets the doors. The doors are only attached by two small plastic screws, so only a criminal only needs a crowbar to gain access. These plastic screws break easily under normal use and the company no longer makes them. When they break, you’ll have to salvage from others’ discarded units if you want to preserve your shed. Easy to put together and clear instructions. Compact, but roomy. Can fit several bikes. Hinges break quickly, especially after a freeze, as do the plastic screws. There are no replacement parts commercially available. 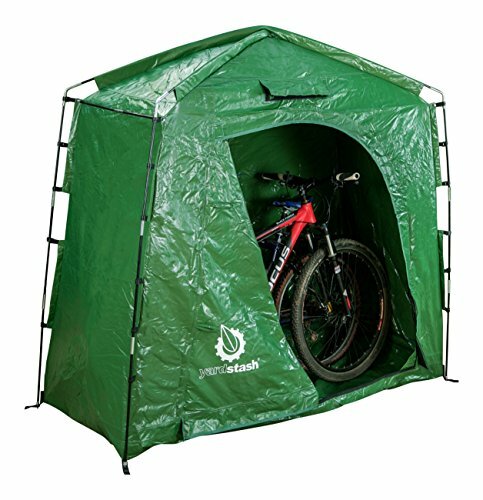 This plastic shed from Lifetime is a great option for those who need natural light to work on their bikes. It comes with four skylights and one shatterproof window. The window is on the smaller side, helping to eliminate it as a possible criminal entry point. The steel reinforced doors also offer an internal lock with the option to add a padlock. The only issue is that this model uses wooden screws to secure the panels. Setting aside the fact that wood is less sturdy than metal, there’s also the potential for rot over time. This means that the shed’s security may wane over time and the screw’s integrity whittles away. The roof’s trusses give under too much pressure, not as sturdy as the doors. Heavy snow sitting atop the shed for too long will cause the roof to cave in. This bicycle cover from YardStash is excellent for short-term use in the weather. For long-term use, I recommend using it in along with your storage shed. It’s a great way to conceal your bike, especially if you have windows. The cover also has two eyelets so that you can still secure your bike, even while it’s in the cover. It can fit two adult-sized bikes comfortably. The only real issue with this cover is that it breaks down within a year if used outside on a constant basis. The material breaks down in the sun and rain and you’ll find rips and holes in it as early as seven months after use. This is another great reason to use it mostly inside a shed. Two eyelets to lock the bike. Breaks down within a year under continuous use. 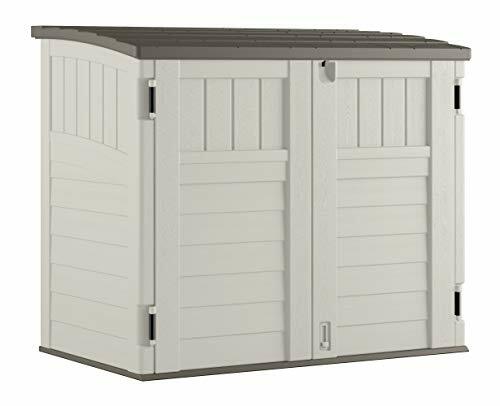 Rubbermaid storage shed is low-maintenance resin and is less than four feet tall. When placed next to a privacy fence, it’s easily concealed from would-be thieves. It’s double-walled to withstand the weather. In fact, some of these models even survived Hurricane Irma! One of the best features of this model is that it includes eight wall anchors for internal security. Externally, this unit allows for a padlock. I would advise against placing your new accessory building in direct sunlight. The plastic melts during periods of high, prolonged temperatures. If possible, place your unit in an area where it doesn’t get much sunlight. Easily concealed behind a privacy fence. The entire unit is less than four feet tall. Doors warp and plastic melts in prolonged direct sunlight. 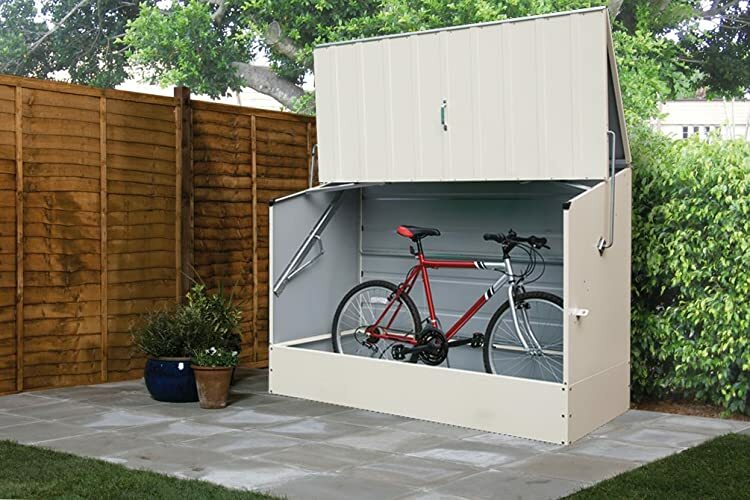 This is a resin storage unit from Suncast that uses a three-door locking system to ensure the safety of your bike. Despite whether you deem it necessary if you don’t place a lock in the provided area, the roof can blow away. This storage building is capable of storing two ninety-six gallon trash receptacles. A standard adult sized bicycle will fit in this unit. The accessory building is waterproof, though drainage upon opening can pose a problem. This is easily amended by wiping the surface of your shed before opening it. Aside from this minor issue, the only other caution is assembling the unit upon a flat, level surface. Failing to do so may result in difficulty closing the doors. Holds two ninety-six gallon trash cans. 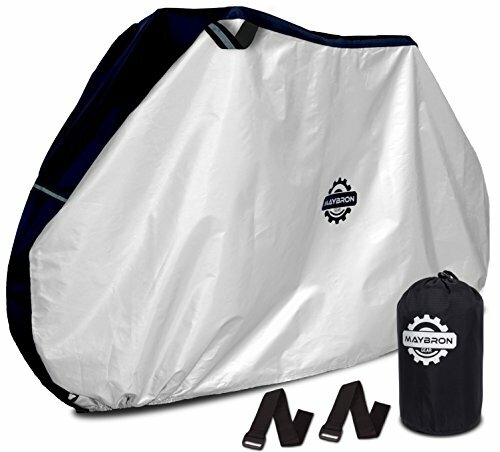 MayBron bike cover is durable and lightweight. It’s excellent for high winds and heavy storms. It incorporates a mix of adjustable buckle and Velcro straps to keep your bike dry. The hem is elastic, so that the cover hugs your bike once in place. One of the great things about MayBron is their customer service. If a customer happens to come across a defective product, they are quick to correct the issue. 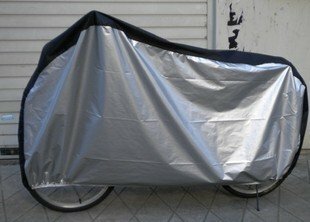 This bike cover also provides lock eyelets in order to secure your bike to an anchor while covered. This is especially helpful if you need to park your bike for a lunch break while you’re out. Spring showers can make for an uncomfortable ride home. Again, if you leave it parked outside, even with a cover, it still runs the risk of theft. For this reason, it’s advised to store the bike inside a locked unit. It provides plenty of ways to secure the cover to the bike. Durable cover that withstands constant, heavier weather. Not compatible with car bike racks; voids warranty. 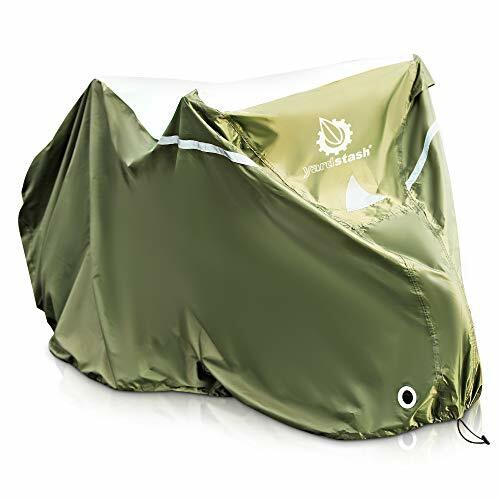 This tarpaulin tent from YardStash is the most UV resistant in the YardStash line. It’s made of a thicker material that resists tearing. The frame is virtually impervious to high winds. The latest model in the YardStash line is suitable for all weather types. One of the most notable improvements is the higher pitched roof of the tent. This not only prevents puddles from gathering, but also allows for easier snow removal. The tent only takes fifteen minutes to assemble and does not require a second person. It’s designed to be portable. This tent also features a built-in floor to keep your bikes off the ground. It fits two adult sized bikes with ease, but a third may fit. Withstands high winds when secured at the base. Little security; accommodates only one small suitcase lock. KLOUD nylon cover is more of a dust cover and occasional use item. The nylon does tear easily compared to other materials chosen for use in bike covers. The cover is waterproof and includes a strap to secure the cover over your bike. My advice would be to use this only as a dust cover or travel cover for your bike. The material is lightweight and easy to fold, so it works well for travel. It fits two adult-sized bikes beneath it, but with some difficulty. You may want to buy separate covers for individual bikes, depending on the size. Lightweight and easy to use as a carry-on for daily rides. Accommodates two bikes, with difficulty. 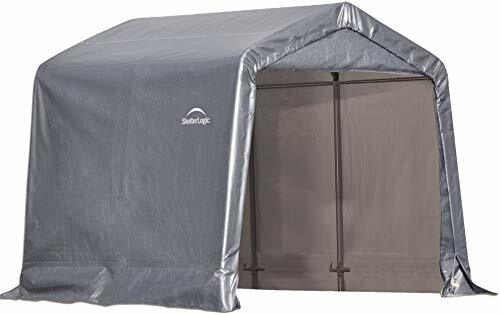 This polyethylene tent from ShelterLogic doesn’t use stitches for the seams. Instead, it’s sealed with heat to increase its waterproofing. The UV blockers are effective up to about six to twelve months, and then you’ll notice stretch marks and rips. There is no floor included with this unit. The steel frame holds up well and there are also eyelets provided for an option to anchor. Putting this tent together will require at least two people. There is no option to lock this tent, so security will be an issue. 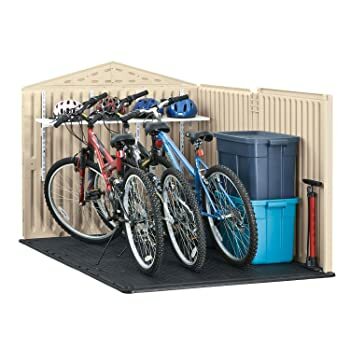 If using this to store your bicycle, it’s best to keep it behind a locked privacy fence within view of your home. Conceals bicycles from criminal temptation. Breaks down within a year. This galvanized steel storage unit from Bosmere is a tank. It’s windowless, has two padlock positions, and you can even bolt it down. Though, with its weight, I sincerely doubt anyone is going to try to haul it out of your yard. The major problem with most metal units is their potential to rust. Bosmere offers a fifteen year warranty against corrosion, though. It’s coated with PVC for added protection against the elements. The only issue with this model is that it doesn’t come with a floor. You’ll need to provide a concrete slab or other base to keep your bikes from sitting on the ground. It fits up to three bikes! When you’re looking at the hinges, pay attention to the screws. If they’re small, a criminal could rip them right out with a good shoulder or kick to the door. If they’re long, are they Phillips or flathead? If so, all a criminal needs is a screwdriver to take the door down and waltz right in. So, how do you increase the security of the hinges? Start by replacing the screws with bolts. When the bolts are in place, tighten the nut on the interior of the door. Use super glue on the nuts for added security. Even if the criminal brings the right tools, the glue adds a time-consuming challenge. Next, pay attention to the lock. 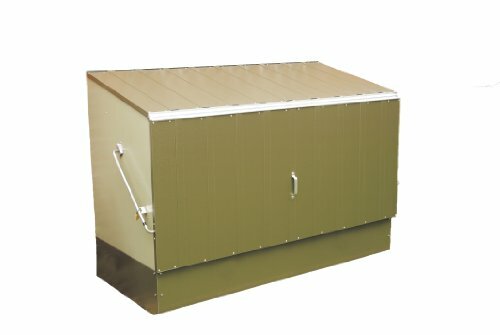 Does your unit come with a reliable one? Either way, it’s best to add a second for good measure. A good padlock may not deter the criminal, but it adds extra time to their break-in plot. Don’t place too many padlocks, thinking it will add more security. In fact, it’s more of a tip-off to criminals that there’s something inside that shed of value. They may be even more determined to break in. Windows in a shed are like a store’s display window. Criminals can peek inside and determine whether there’s anything they like inside. It’s like window-shopping for thieves. If you do have to choose a unit with windows, then spraying an opaque film on the inside is helpful. Determined criminals may break the glass regardless of being able to see inside. Especially if the window is large enough to accommodate their entry. The answer is Plexiglas. A non-shattering substitute can prevent windows from becoming an access point. This is an extra step that requires more work, but it is effective. Last, when choosing your unit, look for ways that you can secure your bike to the inside of the shed. If the criminal makes it past all your precautions, you need an extra safeguard. If your unit doesn’t offer this option, you can buy and install a floor anchor for your bike. Or, as an alternative, you can bolt a chain to the wall and secure your bike with a padlock. Using a motion activated alarm system is another great way to secure your bike. If the thief manages to get the door open or climb in through a window, any movement will trip the sensors. You can buy these sensors in most hardware stores and they’re relatively inexpensive. If nothing else, it could work as a deterrent. The alarm may frighten off criminals, even if you don’t notice the breach. It’s rare, but sometimes criminals will be brazen enough to just load up the whole unit and drive away. Especially if your shed is near a back alleyway where neighbors are less likely to see. For this reason, make sure you secure your building to the ground. This is particularly of importance if the unit is relatively small. If it can fit into the bed of a pickup truck, it’s in more danger than larger units. Not all insurance covers accessory buildings that are not attached to the house. Make sure to read the fine print to determine whether you need to take out a policy exclusive to the shed. If you’re handy with power tools, another option is to build your storage shed yourself. This is often a less expensive option and, best of all, it’s customized to your exact needs. You are in complete control of the materials you use for your bike’s storage when you build it yourself. You are able to build it in a way that covers all the security flaws found in pre-built models, as well. When you build the unit yourself, you have the option of excluding windows altogether. This will help conceal your bike from criminals who try to determine whether your shed is worth it. And last, you’ll be able to build a much sturdier door. You’ll be able to build it with a floor-to-ceiling lock, reinforced door jambs, and so on. I think we can all agree that the Bosmere Trimetals A300 ran away with this top ten list. It has everything we’re looking for (and not looking for) in a bike shed. It doesn’t have any windows, so criminals can’t peek inside. Its doors are solid steel, so it’s going to take more than a shoulder or kick to get through them. And there’s the option to padlock in two places. The other units in this list fell short in one respect or another, either by using flimsy materials or not providing security. The Bosmere is a tank by comparison.